"…The train moved through a multitude of tunnels, only to emerge at dizzying heights and inclinations that made me worry if the tracks could possibly hold the train stable. After some time, I simply stopped looking out of the window to preserve my sanity. Then I gradually became aware of an unearthly noise coming from a great distance. At first I though that some great, primordial beast had emerged from its age-old slumber, for surely nothing else could emit such a penetrating sound. But then I realized that this noise seemed far too regular to come from the throat of any beast, no matter how ancient and unnatural. And then the train moved over another pass, and I finally saw the source of this noise: Kiturab the Clockwork City." This Eastern dwarven realm is dedicated to the idea of progress. Its citizens are not content to just create everything according to the same old procedures - they want to find better procedures! Its many craftsmen constantly compete against each other, and this drive to excel attracts many master artificers from other lands - be they dwarves or not. First among the gods of the people of Gol Algor is Gebral, whose worship comes close to a state religion - and for a nation as dedicated to progress as Gol Algor, this should not be surprising. Other gods with many followers are Bannok, an aspect of Bucatar, whose believers dedicate themselves to making the regions close to the volcanoes hospitable and safe, and Jarmal (Jorunnos), representing those who made it their life's quests to create some particular innovations. Of note are also the Flamekeepers, a cult based in Armand which worships the "Flame Below", an entity living in the heart of the world. Their priests do not have divine spellcasting powers, but they have many powerful arcane and ritual spellcasters among their numbers. 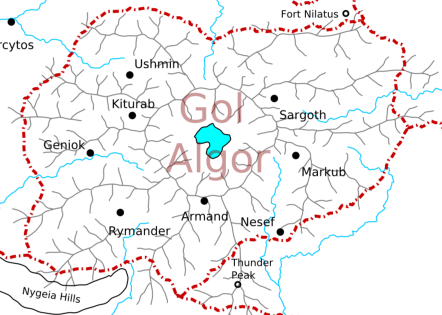 Gol Algor represents the concept of dwarves (and gnomes) as builders and innovators. It also raises some questions about the moral responsibility of those selling weapons to the highest bidder, which GMs might wish to explore.